character (S, C, D, H), or a single * character to indicate a joker. pan2 calculates probabilities by simulating random deals of all unknown cards and then counting outcomes. It uses a Mersenne twister as a pseudo-random number generator, seeded with values derived from the scenario parameters in order to produce repeatable results. When multithreaded evaluation is requested, a simple fork/join procedure is used. Each thread does the same with slightly different seed values, and the overall results are combined at the end. Cards are represented internally by integers in the range 0..63. The first 52 numbers represent standard cards and the last 12 are jokers. This means that internally, each joker is a distinct card, although for most purposes they are treated as indistinguishable. Sets of cards are represented by 64-bit bitmasks. A simple evaluation function called score_hand takes as input a set of usable cards and the set of cards which should be considered wild, in addition to jokers. It identifies the highest-value 5-card poker hand that can be made from the usable cards and returns a score. This evaluation is done in constant time. Scores are two-part integers: upper bits indicate the major rank of a hand (three of a kind, full house, etc. ), while the lower bits indicate the relative value of the hand within that rank. Scores can therefore be compared directly to determine a winning hand, or the upper bits can be used as an index when compiling a hand-rank histogram. Finally, more complex scoring functions need to be used to implement game rules such as lowball and limits on usable cards (as in Omaha hold 'em). For a normally-ranked game with limits on usable cards, the scoring function enumerates all subsets of the available cards of a size equal to the usable card limit and performs simple evaluation, keeping track of the highest score found. Note that in cases where the limit is equal to the hand size (i.e. no effective limit), only one subset is enumerated. For lowball poker, the scoring function enumerates all subsets of exactly 5 cards which don't violate the card-use limits. 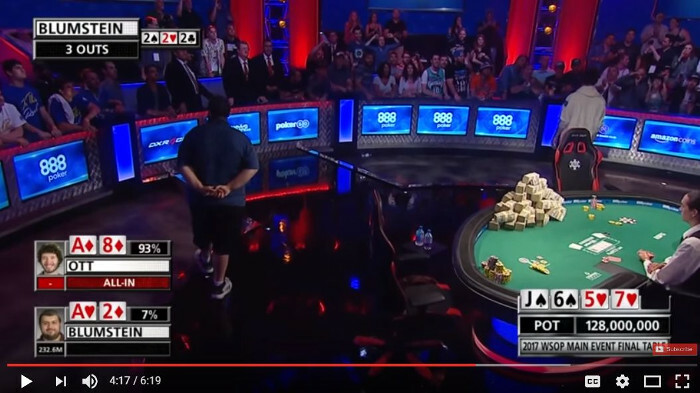 It evaluates each subset and keeps track of the lowest-scoring hand. This is often more expensive than the scoring function described above, even when the hand sizes and card-use limits are the same. The reason for having to do this is that the simple evaluation function determines the score of the highest-value subset in the cards it's given. Note also that wildcards in lowball poker still have their highest-possible-value interpretation in any hand they're used in.